Prehistoric: pre-his-tor-ic (prē-(h)is-ˈtȯr-ik): adjective: of, relating to, or belonging to the era before recorded history. [C1830: via French from ante’–historique]. In December of 2004 my son, his wife and I were on adventure, exploring the unique geologic features of the Tularosa Basin, Otero County. One day, traveling north from Tularosa, New Mexico on highway 54 towards Carrizozo we discovered a Bureau of Land Management (BLM) protected archeological site that was open to the public. A trail winds through the rocks for about one mile of the fifty acre site. There are 21,000 documented petroglyphs. Archaeologists refer to the prehistoric inhabitants of southwest New Mexico as the Mogollon. Those who lived in the mountains are referred to as the Mimbres Mogollon while the Jornada Mogollon are the desert dwellers..The Mogollon lived in pithouse and adobe structures similar to their agricultural cousins the Anasazi, with whom they traded. And like other prehistoric agiculturalists of the Southwest, by the time the Spanish entered New Mexico in the 1500s, the Mogollon had already mysteriously abandoned their pueblos……such as those who lived here on the banks of Three Rivers Creek . Jornada Mogollon people made pictures with stone tools by chipping away the dark oxidized patina on the exterior of the desert rocks. Some of the petroglyphs were made expediently, by simply scratching through the patina to the light inner layer of the rock. Other were painstakingly created by pecking through the patina. This was done with two rocks used like a hammer and chisel. This 1:48 minute slide show is a sample of the ante’– historique petra gluphē symbols and art seen at Three Rivers that day in December. The Three Rivers Petroglyph Site is one of the few locations in the Southwest set aside solely because of its rock art. 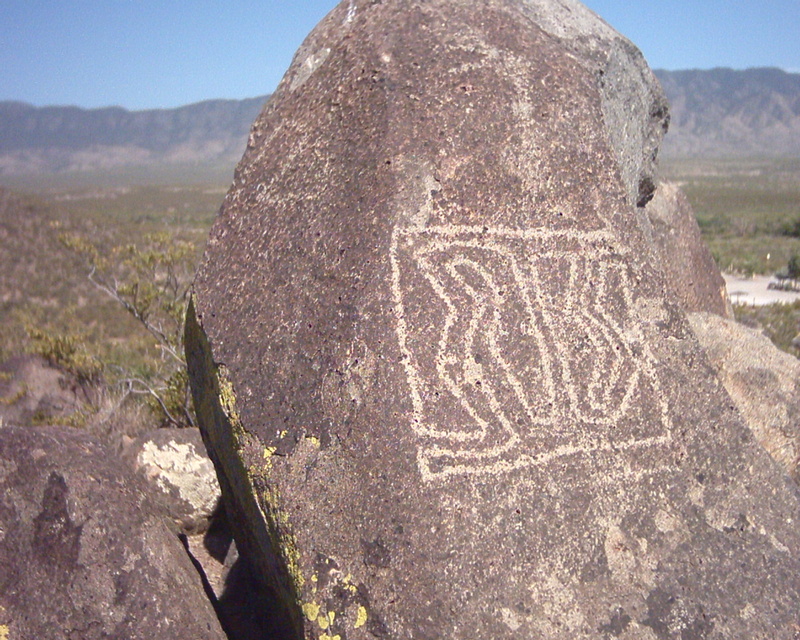 It is also one of the few sites giving visitors such direct access to petroglyphs. 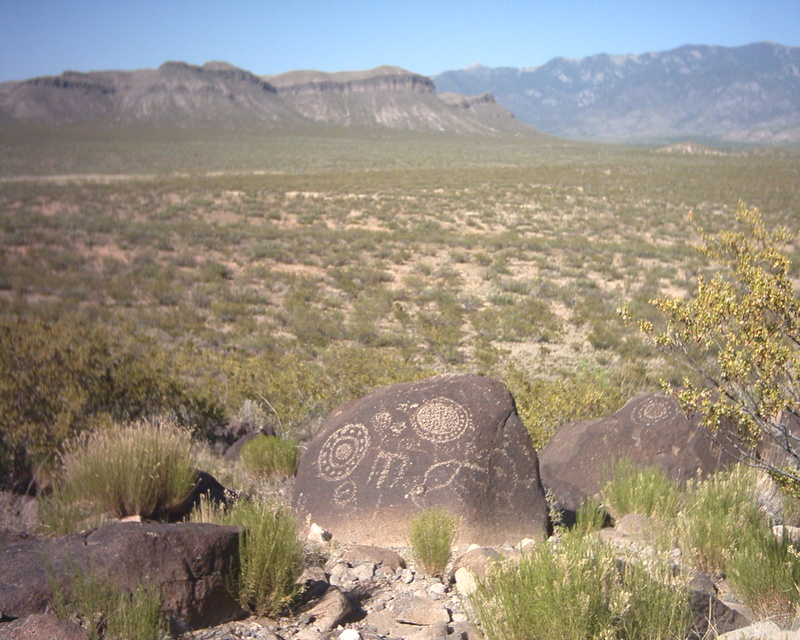 The petroglyphs at Three Rivers were recorded during a 6 year project by the Archaeological Society of New Mexico’s Rock Art Recording Field Schools. Photographs and records are on file at the Bureau of Land Management‘s District Office in Las Cruces , New Mexico. This entry was posted in Art, history, the hungry brain and tagged Art, history, New Mexico, photography. Bookmark the permalink. What an amazing place! I hope to visit some day. Thanks for visiting my blog – I often write about nature, so your posts really resonate with me and I am following you.